Kombucha: Immortal Health Elixir or Homemade Poison? Kombucha is a type of fermented tea that has become incredibly popular, primarily due to its purported health benefits. The idea that kombucha is health is nothing new. Kombucha's history dates back over 2,000 years, and during that time it has been called an "Immortal Health Elixir" in China, spread around the world, embraced in Russia as a healthy beverage, been brewed at home by millions, been commercialized and sold on a large scale in the US and sold as everything from a digestive aid to a cancer cure. On the flip side, the Mayo Clinic, the FDA and others have warned about possible dangers of kombucha. What's to be trusted in this seeming mishmash of ideas about the healthfulness (or harmfulness) of kombucha? How Does Kombucha Harm People? Kombucha, like many medicinal substances, contains the potential for harm. In most cases, problems arise from a lack of careful practices amongst home brewers. In a few other cases, issues come up because kombucha, as a fermented food, naturally contains a small amount of alcohol. Let's talk about the latter issue first. Kombucha contains alcohol. Not usually much — the maximum is often around that of a low-gravity beer — but more alcohol than say, fruit juice. Some people are not sensitive to this alcohol at all, while others are. For most people, it depends on the batch and their individual sensitivity level to alcohol. Women tend to be more sensitive to it than men, and those with a lower body mass tend to be more sensitive, too. But unless you're consuming more than a large glass or drinking very old kombucha, the impact is usually a moderate 'buzz' at most. Now, on to less-than-careful home brewing. While harm from home-brewed kombucha is rare, it is still worth considering when drinking and (especially) preparing kombucha. 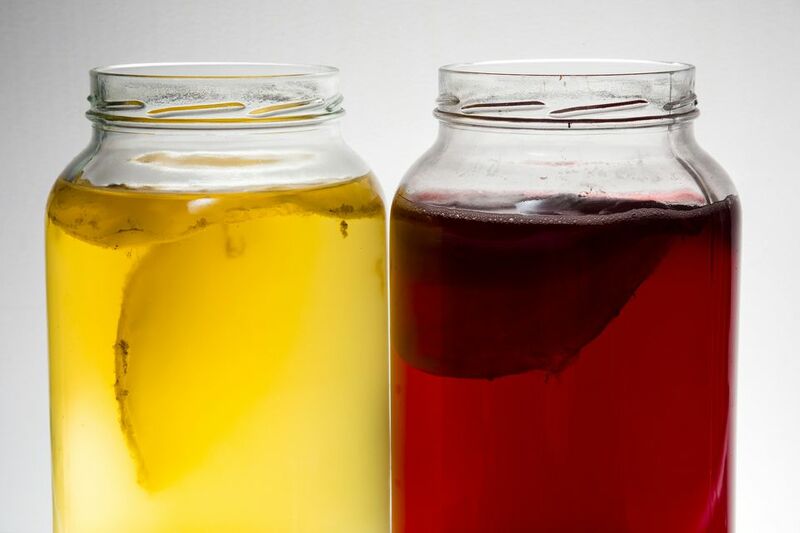 The issue is tied to the fact that most people in the world who drink kombucha are drinking a homemade product that is made from raw, fermented materials. This means that you're (ideally) using good bacteria and yeasts to ferment something, and then you're consuming it without cooking it to kill the bacteria. If you only have good bacteria in the mix, this is incredibly healthy. But when your bacteria get contaminated, then you're headed for trouble. Often, you can tell when a batch of kombucha is bad because of its 'off' odor and flavor. However, some types of contamination are not observable in the aroma and taste of a batch, so even if your homemade kombucha seems fine, it may not be. For most people, drinking a glass of off kombucha won't do much harm, but if you have health issues or you get some particularly nasty bacteria in your kombucha and you drink a lot of it, you could cause an allergic reaction, an infection and/or an upset stomach. In addition to the issue of contamination, uninformed or lackadaisical home brewing can also cause lead poisoning over the long term. How does this happen? If you're fermenting your kombucha in ceramic ware, the kombucha can leach lead from the glaze and gradually poison you. Yikes! Fortunately, this potential issue is pretty easy to avoid. Just brew your kombucha in a glass vessel, such as a wine or beer fermentation jug. How Does Kombucha Benefit Health? Kombucha nourishes and detoxifies the body. Kombucha is rich in many amino-acids, enzymes, bacterial acids, probiotics, antioxidants, glucuronic acid, trace minerals, B vitamins and various other powerful nutrients. Several of these substances may decrease the load on the pancreas and liver, thus aiding the body in its natural detoxification process. Furthermore, the antioxidants in kombucha may boost the immune system and increase energy levels. Kombucha is widely reported to aid in digestion and stomach/intestinal health. Living kombucha contains an enormous amount of beneficial bacteria, meaning that it is probiotic in nature. There are many health benefits associated with probiotics and by extension, kombucha. These include improved digestion, reduction of the symptoms of fibromyalgia, fighting off candida (parasitic yeast) growth and increased mood stability and mental clarity. Kombucha may prevent cancer (or, some say, even cure it). It contains high amounts of glucaric acid, a substance which some studies show prevents cancer. Anecdotally, it purportedly has been cured various people (including Alexander Solzhenitsyn, the author, and Nobel-prize winner) of cancer. In Russia, kombucha is known as 'tea kvas' (with 'kvas' being a sort of homemade Russian malt beer) and said to be the reason that large areas of the country have abnormally low cancer rates. Kombucha may be good for your joints. Kombucha features a group of chemical compounds called glucosamines. Glucosamines are considered to be a powerful preventer of and treatment for arthritis. This is because they increase the body's production of hyaluronic acid, a compound which preserves, maintains and protects joints in a variety of ways. What's the Bottom Line on Kombucha and Health? There are some potential dangers associated with kombucha. However, these can generally be avoided with safe kombucha making and consumption. There is limited empirical evidence that kombucha is beneficial to health, but there is abundant anecdotal evidence that it helps the body and mind in a variety of ways. Only you can know for yourself whether or not kombucha is something you would like to make a regular part of your diet. Listen to your instincts and best judgments, and feel your body's unique response to kombucha to determine whether it's right for you.